Free-standing embroidery designs are designs that can stand alone without a foundation fabric. They are made on disappearing stabilizers, most often water-soluble ones. Usually FSL designs have dense underlay stitches, which support the embroidery. 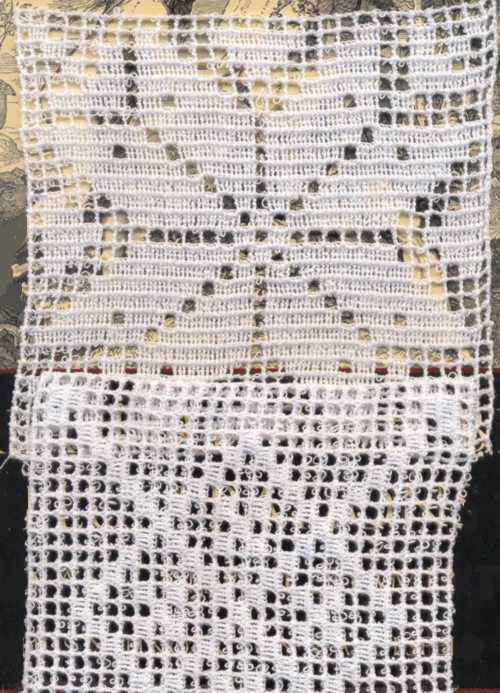 The crochet-style FSL designs are made to imitate crochet and do not have dense underlay stitches. 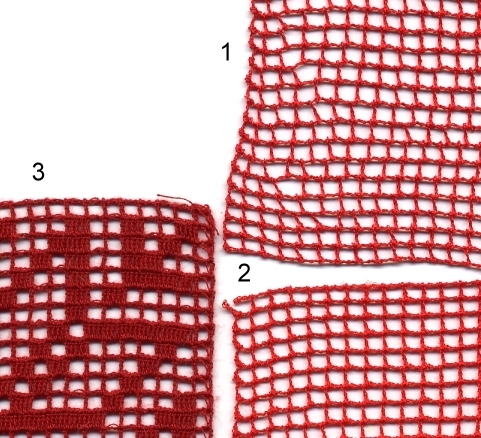 Film-like water soluble stabilizers, such as Solvy by Sulky, Avalon by Madeira, Badge Master, are not suitable for Free-Standing Crochet Lace embroidery. 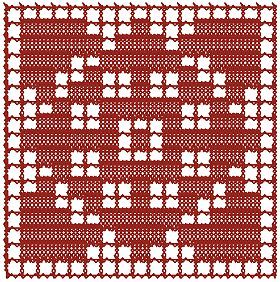 Threads: We tested crochet-style FSL designs using 40-weight rayon and filament polyester from both Madeira and Isacord; 50-weight filament and 60-weight spun polyester from Brother; 40- and 50-weight quilting cotton threads and 60-weight embroidery cotton threads of different brands. We personally liked the results we got with 60-weight Mettler embroidery cotton threads and 40-weight Signature machine quilting thread. On the picture: Sample 1 is made using Isacord polyester: the design deforms, stretches and does not keep its shape, some stitches are loose; we got the same result with all filament polyester threads. We DO NOT recommend using filament polyester for crochet. Sample 3 is made using "Country Yarn", the 60-weight Brother spun polyester with matte finish: the sample keeps its shape well and looks like real crochet. Sorry to say, this product is discontinued by the manufacturer. But if you still have its supply you can use it for crochet. We liked most the samples we made using 60-weight mercerised cotton. We used different brands, Mettler and Clark & Coats, among them. The 100% cotton machine quilting threads also give good results. We liked Signature most of all. If you like, you can try different cotton threads yourself and choose which you like best. Our free sample can be downloaded at the end of this tutorial. 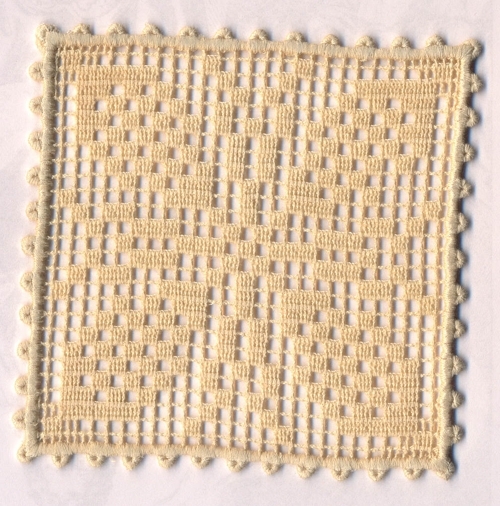 This sample is of 60-weight Mettler cotton embroidery thread. 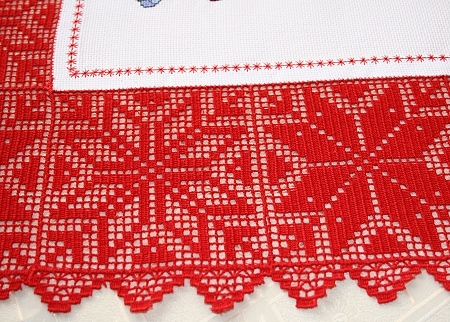 It's very important to use the SAME thread for the needle thread and bobbin thread when embroidering crochet-style FSL. Hooping: We use 1 layer of water-soluble Vilene with our crochet-style FSL designs. It's very important to hoop the stabilizer very tightly, like a drum skin. 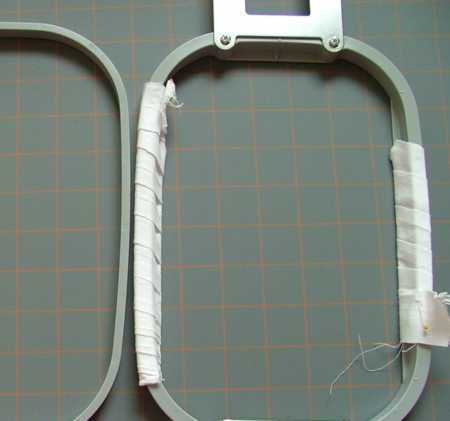 If your hoop does not hold the thin layer of stabilizer well, we recommend to wrap muslin strips around the long sides of your hoop's upper frame. In the first sample the tension of the threads is incorrect. In the second sample the different threads were used in the needle and in the bobbin. Step One: Download the design, and unzip the file. Step Two: Upload the design into your machine. DO NOT re-size the design, it will lead to deformation of the design. Step Three: Thread the needle and the bobbin. Use the SAME threads for the needle and for the bobbin. Step Four: Hoop a layer of water-soluble Vilene and insert the hoop into your machine. Stitch out the design. This is a test embroidery. Step Five: Take the sample out of the hoop, cut away the excess stabilizer and rinse the remaining stabilizer away with warm water. Lay flat, spread and leave to air dry. Press with steam. If you're satisfied with the sample, you can now embroider your project. 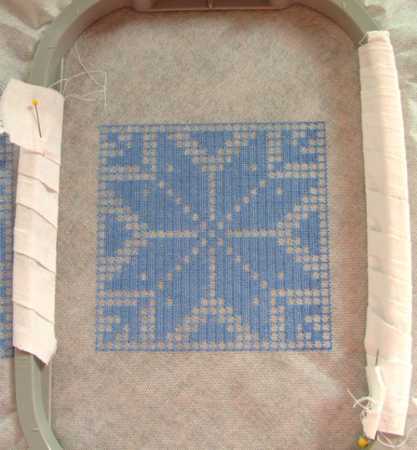 When you embroider designs for a project, DO NOT dissolve the stabilizer. Leave all the designs with the stabilizer until after you assemble the project. Note: Do not rinse the stabilizer with hot water! The hotter the water, the faster the stabilizer dissolves, BUT hot water may result in unwanted side effects such as shrinkage of the fabric and cotton threads or running of the dyes.